Join Twin Cities Geek for a 21+ Night at the Science Museum of Minnesota! The Science Museum of Minnesota’s monthly Social Science event is an adults-only night where you can explore the museum, grab a drink, catch special presentations and activities, and more with a 21+ crowd of fellow science lovers. This month, the museum is going extra geeky with a theme of Sci-Fi Con—and you can bet we’ll be there doing our part! appreciate sci-fi monsters and heroes with SuperMonster市City! Costumes of all kinds encouraged! Click here for more information, and click here to download a free pass from MetroTransit specifically for this event. So, have we piqued your interest? 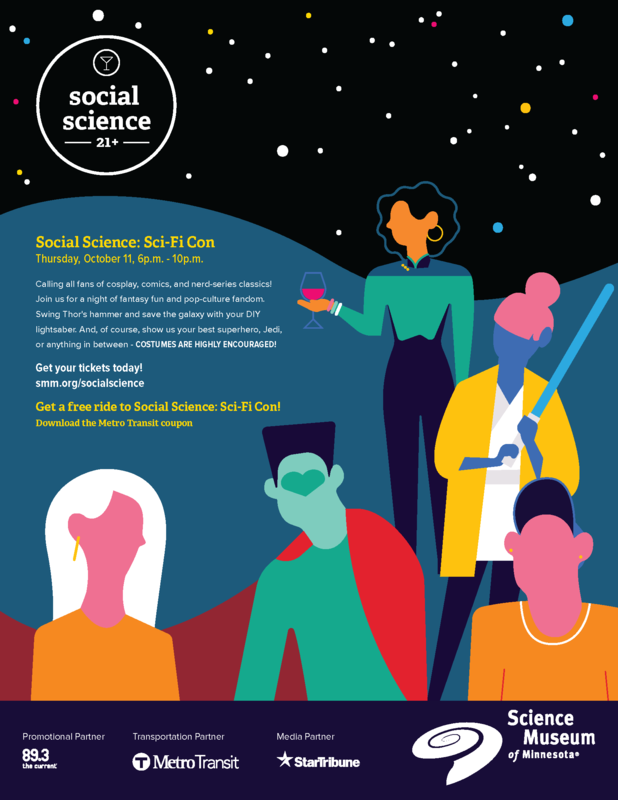 Here’s your chance to win free tickets to Social Science! Head on over to Facebook and (1) like the Twin Cities Geek fan page and (2) comment on the featured giveaway post by 7:00 p.m. Central on October 5, 2018, telling us which part of this event you’re most interested to check out. We’ll randomly choose one winner to get 2 tickets—so start thinking about who you want to bring! No purchase necessary. Total number of prizes is 1, each consisting of 2 tickets to be held at will-call (retail value up to $37.90). Any other expenses incurred as a result of winning this prize, including taxes, are the sole responsibility of the winner. Fulfillment by the Science Museum of Minnesota. This giveaway is in no way sponsored, endorsed, administered by or associated with Facebook. Participation constitutes a release of Facebook by each user with respect to the promotion. How to Enter: Like the Twin Cities Geek fan page (http://www.facebook.com/TwinCitiesGeek) on Facebook and respond to the giveaway prompt. One entry per person. Eligibility: One entry per person. Void where prohibited by law. In order for an entry to be counted, the comment must be posted by 7:00 p.m. Central on October 5, 2018; the comment must follow the giveaway prompt as described above; and the account posting the comment must like the Twin Cities Geek Facebook fan page. Attendees must be at least 21 years old and present valid photo ID to be admitted to the event. Current Twin Cities Geek contributors and editors are not eligible for entry.